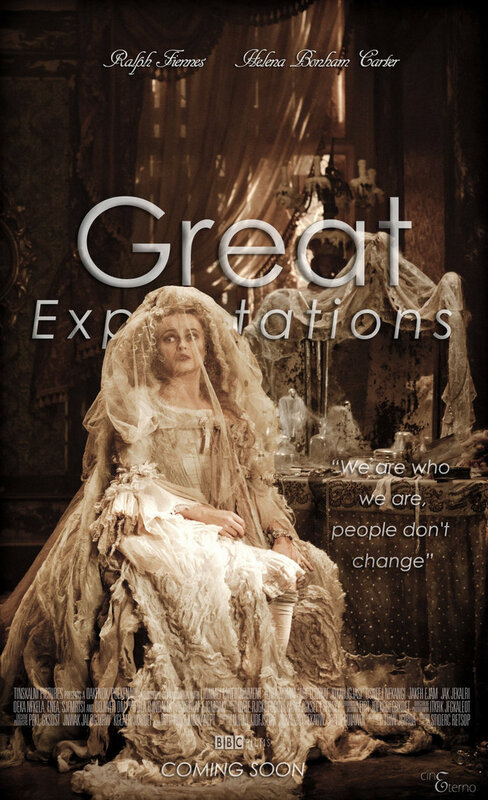 Charles Dickens' superlative novel, Great Expectations, has been adapted many times for the small and large screen. The first theatrical outing was in 1917, the most recent TV adaptation last year, with a notable contemporary version by Alfonso Cuaron starring Gwyneth Paltrow as Estella and Anne Bancroft as the Miss Havisham character. My personal favourite is the TV movie from 1999 directed by Julian Jarrold (BRIDESHEAD REVISITED), with Ioan Gruffud as Pip, Justine Waddell as Estella, and an absolutely definitive Charlotte Rampling as Miss Havisham. Given the rich canon of work, a high bar should be set for any new production. One should ask what this particular interpretation is going to do anything that is new and insightful. Surely it isn't enough just to create another film simply because it has been five years since the last one, and there's a nice commercial tie-in with the Dickens bicentenary. Sadly, I suspect that's exactly the motivation for Mike Newell's new version of the novel. And I can't say it surprises me. His career looks very much like one of a moderately talented director for hire, without any clear over-riding style or thematic consistency. How else dos one explain credits that vary from DONNIE BRASCO to HARRY POTTER & THE GOBLET OF FIRE to PRINCE OF PERSIA: SANDS OF TIME? That said, a cursory look at the production notes suggested a movie that could be something very special indeed. Given her personal Gothic style and amazing talent, one might have thought Helena Bonham Carter born to play Miss Havisham - the rich, capricious, vengeful woman who raises her adopted Estella to be a cold-hearted temptress and so have her revenge on men. Holliday Grainger, so impressive as Lucrezia in TV's The Borgias, would not have far to go in depicting the tragically emotionally blighted Estella. Jeremy Irvine, the likeable boy at the heart of WAR HORSE, would make a touching Pip - the young working class lad whose head is turned by an inheritance and his love for Estella. And the rest of the cast is a who's who of British talent, starting with Ralph Fiennes - so sinister as Heathcliff - as Magwitch, the convict whose life is entwined with that of Pip - Robbie Coltrane as the ruthless lawyer Jaggers and Jason Flemyng as the kind-hearted blacksmith Joe Gargery. I was quite ready to believe that a half faithful script and half decent production design would allow these actors to create a GREAT EXPECTATIONS that was both Gothic and sinister as well as heartbreaking: the tale of a young boy corrupted by wealth and redeemed by love, and of the corrosive impact of secrets. On one level, the movie is a success. The story of Magwitch and his unlikely friendship with Pip - his life mangled by the Justice system, and redeemed by his recognition of a kindly act - is given almost half of the screentime, and Ralph Fiennes really is marvellous. I'm not sure that Jeremy Irvine matches him, but that would be a tall order indeed. The story of Pip and his friend Joe, so bound up in the start and end of the story, is also given room to breathe, and I believe that this role is Jason Flemyng's finest and that he is also the best Joe Gargery I've seen on screen. The problem is with the Satis House storyline. I'm not quite sure why but Helena Bonham Carter's performance just falls flat. She is neither sinister nor tragic. Poor Estella gets very little screentime indeed, and her marriage to the brutal Bentley Drummle is rather thrown away. Does the audience unfamiliar with the novel realise that he has beaten her into submission? Poor Herbert Pocket gets very little screentime, although both Olly Alexander as older Herbert, and Charlie Callaghan as Young Herbert are scene stealers. Overall, then, a rather flat, imbalanced movie in which the Magwitch storyline is creditably done and Satis House isn't. And as Satis House is what this novel is ultimately remembered for, that is a fatal flaw indeed. GREAT EXPECTATIONS played Toronto 2012 and will be released in the UK and Ireland on November 30th 2012. It opens in Germany on December 6th; in Russia on January 24th 2013 and in New Zealand on March 7th.